Save money, save time and improve results. 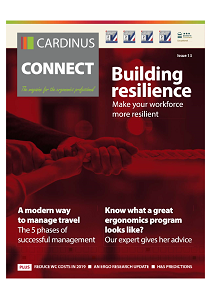 For over 20 years Cardinus has helped employees like yours to proactively prevent injuries caused by poor engagement with their workstation. Our flagship product, Healthy Working, is used by over 2,000 organizations who utilize the program to reduce injuries, improve productivity and to comply with overseas regulation. We can demonstrate impressive results across all industries; energy, finance, pharmaceuticals, utilities and many more. Through a combination of e-learning, self-assessment and ergonomics intervention your employees are empowered to take ownership of their workstation well-being. Protect your employees with our award-winning office ergonomics program, Healthy Working. Our software helps you to easily roll out an ergonomics program and includes self-assessment and detailed organization-wide risk management and reporting to help you effectively manage office ergonomics. Materials Handling Plus is designed to help your employees identify and mitigate risk across the workplace and beyond. It reduces the risk of accidents. If you’re struggling to keep on top of your ergonomics program, our managed service provide a complete solution, covering e-learning, telephonic and on-site intervention and triage. News and views from the world of ergonomics and health and safety.